Blog — Inventus Mining Corp. Interior of Black Fox Mill building. After an unanticipated 4-week delay, while we worked with the environmental regulators responsible for the Black Fox Mill, I'm pleased to say we received the all clear on Nov 17. The Pardo Bulk Sample is in line to be processed sometime in December. We will provide more specific timing when it's available. 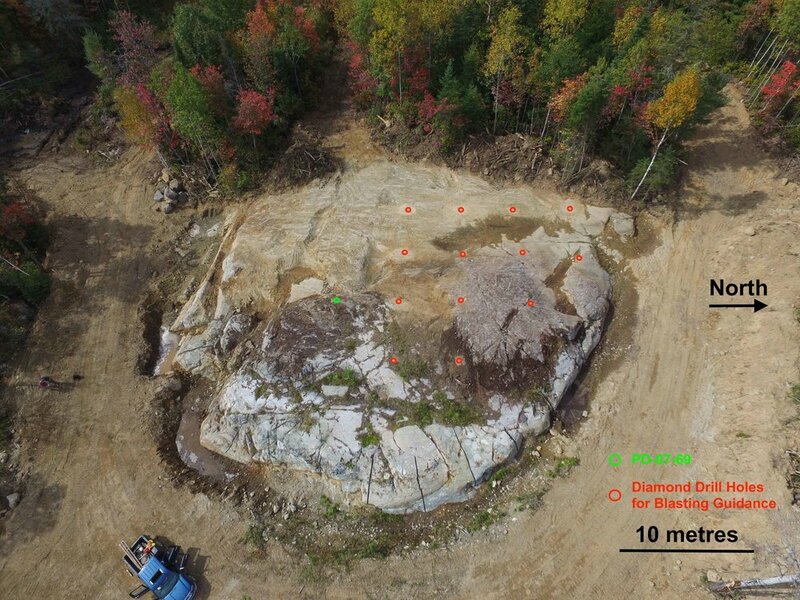 Shipments of bulk sample material from Pardo to McEwen Mining's Black Fox-Stock Mill (located near Timmins) have started. Examples of the Mississagi boulder conglomerates that hosts the target gold mineralization in our bulk sample. These specimens contain "buckshot" pyrite and fine gained detrital pyrite that are frequently associated with gold. Wesley Whymark, Chief Geologist, on the first bench of the Trench 1 bulk sample site. Our drillers are Asabanaka Drill Services from the Kasibonika Lake First Nation. The rig and crew were great, we recommend them, email us for contacts. 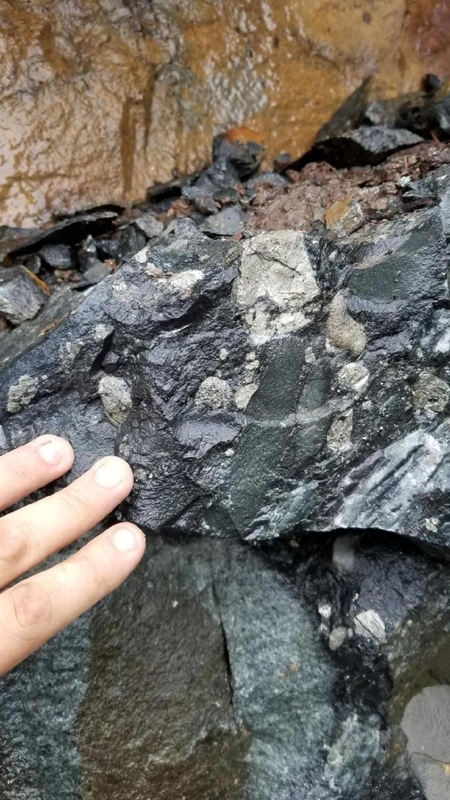 Diamond drilling will occur prior to blasting to provide samples for assay as well as give the blasters precise information about the location and thickness of the mineralized zone. PD-07-69 was a small diameter drill core from 2007 which intersected 4.7 gpt gold over 2m (half core fire assay). Equipment is on site clearing vegetation and soil from the location of the 1,000 t bulk sample. The next step is diamond drilling. Check-in here from time-to-time for updates. Interesting academic paper by our Chief Geologist Wesley Whymark which was published in April 2017. Created this map to help illustrate for investors who are asking about the scale of Novo's new find at Purdy's Reward (based on what little we know so far) compared to the geologic setting we have at Pardo. Below are two maps at the same scale. Until this point Inventus has not made an effort to 3D model the geology and gold mineralization at Pardo. This was mainly because we didn't have sufficiently dense drilling over a wide enough area. With the recently completed 65 hole program, we have developed a Leapfrog model that will assist with exploration and ultimately estimation of what we have there. Bottom channel sample is from the Witwatersrand basin in South Africa. Unfortunately I don't know the grade of the bottom sample. Figure below is a grade thickness contour using all holes in the core area we've been drilling. As we described in our March 1st, 2017 news release, pre-2017 drill results have a tendency to under represent the gold grade due to sampling procedures at the time. This figure shows the areas where the contoured area is open for expansion with additional drilling, which is what we are currently working on. Figure below is a map showing our exploration targets in order of priority. The purple rectangle encompassing areas A&B corresponds to the area shown in the map above. This channel sampling from late 2014 was never published. The area is called Line 34, which is about 4 km southwest of where we are currently drilling. Should be revisited this field season. The channels runs 1.5 gpt over 4.5 m, including 2.9 gpt over 1.0 m. True thickness appears to be about 3 m.
Hole PD-17-13 had 7 occurrences of VG in core interval (15.47 gpt gold over 0.63 m). This is the largest cluster of gold grains. Picture of panning gravity concentrate from 007 Zone. This diagram is from a really interesting book about the history of the Witwatersrand goldfields in South Africa (ISBN 0 620 09663 2). It helped me to visualize what occurred at Pardo as well. Gold is concentrated along the banks of those channels, one can imagine the distribution of gold is complex as the position of channels changes over time. Finding and following "pay streaks" is how the South African miners developed the Wits. Gold grains from this sample are quite small, but it was still possible to pan some of them out of the concentrates. We're evaluating producing a gravity concentrate as the first step in processing larger bulk samples. Hope to provide an update on this soon.